After our two-week stay in Ueda City, it was nice to have a change of scenery and new host families. Hiroshima and Ueda are very different in many ways. Hiroshima is a huge city with many people and buildings where as Ueda is much smaller and in the countryside. Being in Hiroshima raised emotions for many of us and gave everyone a better understanding about what happened in this city on the 6th of August, 1945. 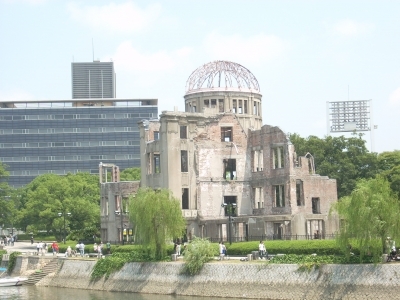 When the atomic bomb was dropped on Hiroshima, it took the lives of over a hundred thousand people with devastating results and ongoing grief still felt today. World Campus International participants and staff attended the memorial service remembering the day that this catastrophic event occurred. People all over Japan watched the ceremony on their televisions and listened to the peaceful words of the speakers. The following message, read by two sixth graders at the service, remained in the minds of all of us: …”nothing will come of inflicting the hardships and sadness that we suffer onto others – doing so will only cause an endless continuation of the same suffering. The creation of a peaceful world requires that each of us display kindness and strength to become the final link in the chains of hatred and sorrow that we encounter. It is also important that we transcend cultural and historical differences, accept each other, and understand each other’s thoughts and feelings”. A day after the public ceremony, we were so fortunate to have a survivor of the bombing speak to our class. Everyone sat in awe as the victim of the A-Bomb told her stories. Although impossible to put ourselves in the shoes of this women, she was able to convey what she went through on this unthinkable day. She told us that the reason she talks about her experience is to motivate people to bring peace to the world. After learning so much about the human and other costs of this military strike, many participants started to realize how many wars are currently going on that we do not pay attention to. World Campus’ members from Uganda talked about some of the wars that are continuing to be fought on their own African continent. The world is very large and it became clear to all of us that we have so much to learn about. Our next city stop is in the Nagasaki prefecture and we are all ready to learn more about these tragic events and see how this other city has recovered as well as hear further views on the war. i am glad to read you are enjoying Japan. It’s even more of a pleasure to read you had the chance to stay in Hiroshima and feel the impact of war and the atomic bomb. I had the chance to be there in 2005 and i can not express how much of an impact it had on me. I remember the survivor we spoke to, told us she was telling her story to us, because she wanted us to retell it to anyone we know. I still often do and still have the picture of Sadako on my computer screen, so i get remembered by it every day. I hope you guys will tell the story to as many people as possible as well, so that eventually the world will get free from atomic bombs. I just wanted to let you guys know this… but I know for sure that your tour will be also filled with happy (historical) emotional events. Enjoy every moment of it!!! As Els mentioned, talking to the survivor was truly touching. Along with the museum-visiting and our discussions. That was a very good start for all of us–inspired everyone to think about what we can do and what we need to do at the moment, at this stage. Now at home I can’t stop checking this blog and catch up with the group. I miss the life on the road very much. I wish I would go back and experience everything again. Have fun and enjoy the last 10 days guys, I miss you!